1) Go to your Kapost Byline Plugin and enable Preview: Whenever you integrate Kapost with Drupal, we require you to install a plugin. To add or upgrade your plugin, log into your Drupal instance and go to the menu at the top. Choose modules. Scroll down to the Kapost Byline plugin. Make sure it is set to the latest version and click "Configure." Check the box next to Preview to enable it. 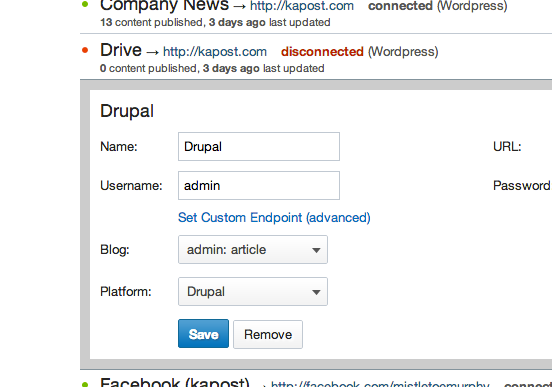 2) In Kapost, go into your App Center menu and refresh your connection to the appropriate Drupal site by clicking edit and save (do NOT remove and re-add your connection). Once these steps are complete, you will see a Preview option under the More button on the Content page. To preview your content during the creation process, simply click Preview. A box will appear prompting you to pick the destination for your preview if you have more than one blog available. Choose the Drupal blog you would see. A preview of your post should a appear in a new window.